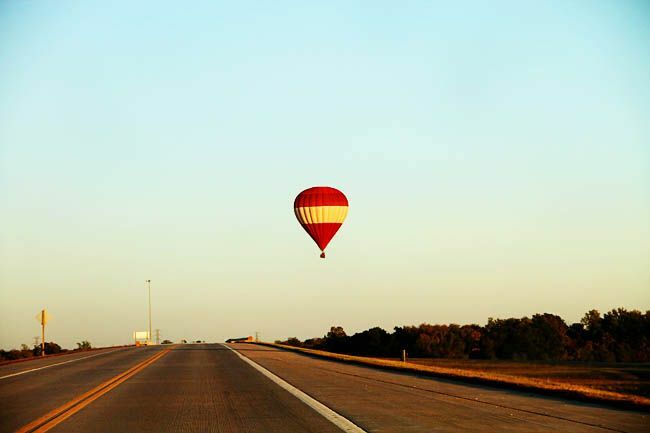 As we were on our way to the airport recently, driving through Kansas, a hot air balloon floated right over the road above us. I grabbed my camera and snapped a few pictures through the dirty windshield. Let's give away a $25 gift certificate to The Rusted Chain! 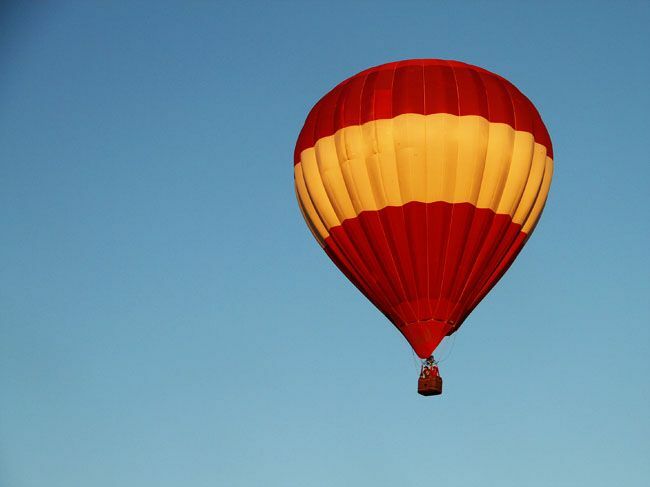 Just leave a comment answering this: Have you ever been up in a hot air balloon? For additional entries: Facebook this, tweet it, blog it, pin it on pinterest. We'll draw a random winner soon. No, but I really want to! Some day! When my Mother-in-law turned 60, my husband and I surprised her with a ride in a hot-air balloon, so I have! It was very neat. No, but we watch them at the Balloon Races every year! Never been in a hot air balloon, but it gives me the willies! :) New here & love the blog! Have never been but it is on my "Bucket List"
No I have not, but would love to someday! We love going to the balloon festivals and watching them launch. No, but I want to. There is a family that gives rides right here in our community even. Need to get on that. Nope but I bet it's fun. I'd definitely like to go to the festival out in Albuquerque some time. Yep! I have. They do a festival in my hometown every Memorial Day and I was lucky enough to know someone participating one year. Never have but really want to!! I want to go over Napa Valley, CA!! Yes!! Some people were giving people rides in a field across from my sister's place. We grabbed our cameras and rushed over. It was awesome!! Nope I have not! I wanted to when i was younger Now I really would rather not. I guess I must have lost my edge. I have never done it! I am terrified of heights, but oddly would love to force myself to try it! I bet the view is fabulous!! Only in a "tethered" hot air balloon. It was fun! No but would like to "someday". No, but they fly over us all the time (day trips from Napa)...someday I hope to! I am terrified of heights - so nope, never been up - they are so pretty though! No, I havn't, but I really really would love too! On my bucket list for sure!! Facebooked this on my company page as well! I have NOT been up in a hot air balloon. I'd love to, though! We DID have a balloon-chasing experience this summer though. I got some great pictures too. It was exhilarating! I just posted a link on Facebook! No and I probably never will, but I love seeing them floating in the sky. They are quite beautiful. Never been in a hot air balloon but I'd like to! I have never been in a hot air balloon. I wish. It's just very expensive. Went in one in Colorado 25 years ago. It was breathtaking! I have not, but I would LOVE to! Looks so fun! It is on. My bucket list. Nope. And I've never won on here either. No, but I think it would be a ton of fun!!! Nope, but that sure would be a cool experience! I have not....and if I ever did I would probably be terrified. Looks like a cool experience though! I have not, i would love to but dont think i'd even have the guts to do it! Not yet... maybe one day! We did used to have a hot air balloon festival in my town when I was a child. I loved driving to church and seeing hundreds of them rising into the morning sky! It was so colorful! It's on my bucket list though! Yes! It was fantastic. Can't wait to do it again. Nope, I am deathly afraid of heights. So thats not on my list of things to do. How cool. I haven't been in one, but my youngest sister has. She was in elementary school, they floated right over our neighborhood! I think at this point in my life I'd have rubber knees the whole time...something about the basket being small and "wiggly", ha! No, I haven't. I kind of do and don't want to try it since I am kind of afraid of heights. No, they do create such a fantasy image that I think I might like to, but I hear they are very noisy...leading me to believe they are best enjoyed from the ground, or from your lovely photos. Nope! Never have! But I have dressed like a salsa dancer before. What? Is that totally unrelated to you? 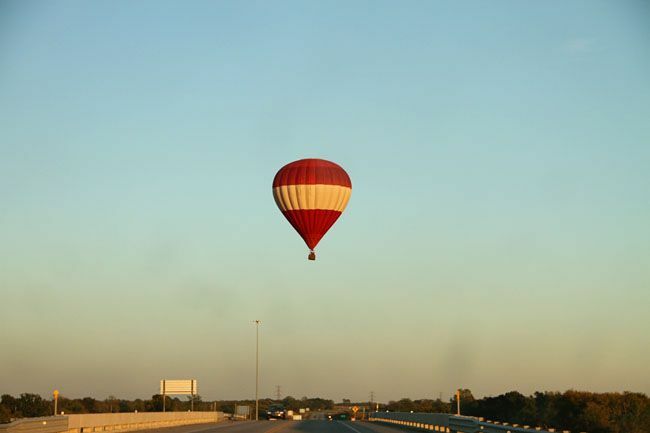 I haven't been up in one, but I grew up near Battle Creek, MI, where they have a hot air balloon festival every summer...so neat to see!!! No, I haven't, but I really want to. It is on my bucket list. Love the photos btw. I haven't but I'm dying to try! Looks so fun! No, and I don't think my stomach would handle it. I do love to watch from solid ground! No, not yet...I kinda' like the ground...but I would like to go to a hot air balloon festival sometime. Have only been on one in my dreams. Always wanted to go to the big festival in Albuquerque, too. No, I haven't been on a hot air balloon - but think it would be an awesome experience. Maybe someday! No- I don't like heights! Was in a hot air balloon once. My husband and I went up on our 20th wedding anniversary. It was absolutely awesome!!! Giveaway link shared on facebook. I've never been up--but it sounds wonderful! I've never been up in a hot air balloon but I'd love to go in one! 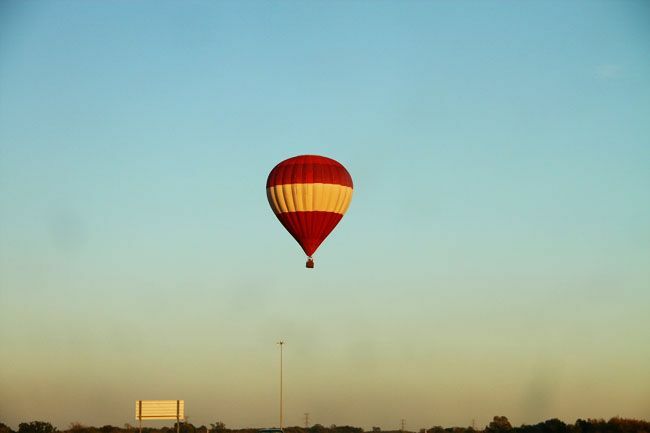 I have never been in a hot air balloon but I've always wanted to take a ride! Such an adventure that would be! I have never been on a hot air balloon but they are big in my area- we even have a festival! Just this morning, I passed one that was landed on the side of a freeway. I've even had one land in my yard! I have never been in a hot air balloon! I am terrified of heights, so I don't think I'll ever ride in one. I do love their fun, bright colors though! I have never been up in a hot air balloon. I love watching them but I don't think it is for me. No. Don't think I ever will. Never have, but would like too ! Not yet, but it's on the list! No, but I would like to! They are so pretty! i have not....but i would love to. we have a local balloon festival, it is one of the prettiest skies ever with all the balloons. Never been in a hot air balloon. It does look like fun. I would just love to go to a balloon festival. Yes, but only on the ground when I was a kid, never went up in one! I (sadly) have never been in a hot air balloon. I wish I could go in one! nope...and i never will! heights SCARE me!!! I haven't, but always thought it would be fun. They really are amazing to see up close aren't they?! I live in albuquerque, NM hot air balloon capital of the world. =0) We just had the balloon fiesta here a couple of weeks ago where literally hundreds of balloons launch every morning. I haven't been in one, but I never get tired of watching them. I would love to win! You couldn't pay me enough to go in a hot air balloon but I sure would love to win a gift certificate to The Rusted Chain!!!! Oh yes! And it is one of THE best rides one can have. We took our ride in Arizona and loves every minute of it. we would do it again in a heartbeat! I have never been up in a hot air balloon, and don't think I could do it. Yes I have! It is something I thought that I would never have the nerve to do, but had the opportunity about 6 years ago and decided...you only live once...might as well have some fun with it! It was AWESOME!! I'd love to go up in the Hot Air Balloon Festival in New Mexico. Nice shots btw!! some day I hope to do so. I haven't, but I saw one on the way to work on Friday! My husband and I do want to go up in one someday though. Never, but I'd love to sometime! We have a balloon festival near us that we love to go see each year. Not yet, but its on my bucket list! Ohh this is too perfect! First, I must say I just came across your jewelry today after stumbling across theidearoom.net's blog and I immediately went to your page. I bought a necklace just like your hand-stamped necklaces that had 2-stamped charms; one said Peace and the other said Love. Then it had too little adornment accessories and I just loved it! So I was Heartbroken after it broke after 2 days! =( So, when I seen how your necklaces resembled that one, I was stoked! Then, I seen your recent post to win a gift-certificate. I say this is too perfect, Becaaause.. I just had my first experience in a hot air balloon LAST NIGHT! =D It was an attraction at a park with a haunted house and haunted woods. All they do is let you float up and stay in one place though, but it was still very cool to experience. It was dark so it made it a bit scarier! I don't know if I could handle just aimlessly floating through the air in one, scary! lol But anyways, that's my experience. Love your jewelery, so glad I found it! yes actually just this summer for the very first time. it was awesome and would love to do it again. I haven't but I would love to go to the festival in New Mexico. No way, I am extremely scared of heights! I have not been up in a hot air balloon. Looks fun, but I am somewhat afraid of heights. I would LOVE to go for a ride sometime!! Happy Halloween! No!! I think I am to scared of heights. Never but I think they are lovely. I have never been on one, but I would love to! Yes, I was lucky enough to go on one when I was probably in college (or maybe high school.) Family friends owned one. Nope, but I would love to float over the countryside. No city for me though...I just want the country. I've never rode in a hot air balloon, but I will eventually. I have a fear of heights but think the views and floating might be worth it.